'Lebanon Mist' OGB (Les Peterson, R. 1980). Seedling LP 78-12AA. AB, 20" (51 cm). Early midseason bloom. Standards clean white; Falls pale oyster shell white, smudged bronze gray across hafts and around beard; small, deeper bronze gray signal and beard. LP73-8A: 'Glory Born' x 'Tuesday Song') X 'Story Theme'. Les Peterson and Aril Society, 1981. From AIS Bulletin #241 April 1981 Introducing LEBANON MIST. AB (1/2), 20" (51 cm), EM. 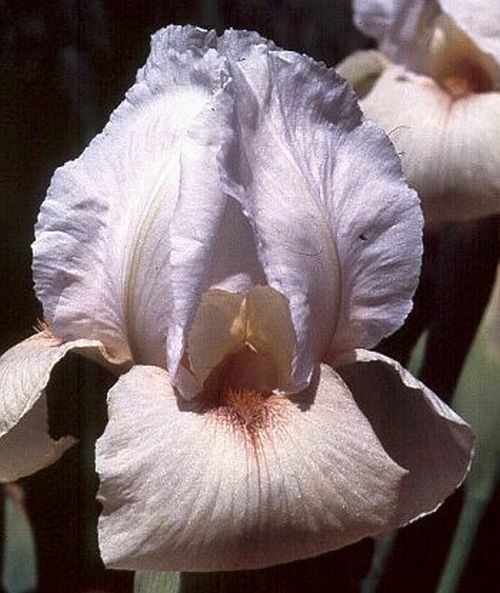 Standards are large, wide, cupped and of clean white; falls, nicely recurved, are pale oyster shell white, deeply tinted bronzegrey across hafts and surrounding like-colored beards and small signal. An arilbred lover's choice. ((Glory Born x Tuesday Song) x (Glory Born x Tuesday Song)) x Story Theme. HC '80. $20.00. Les Peterson.